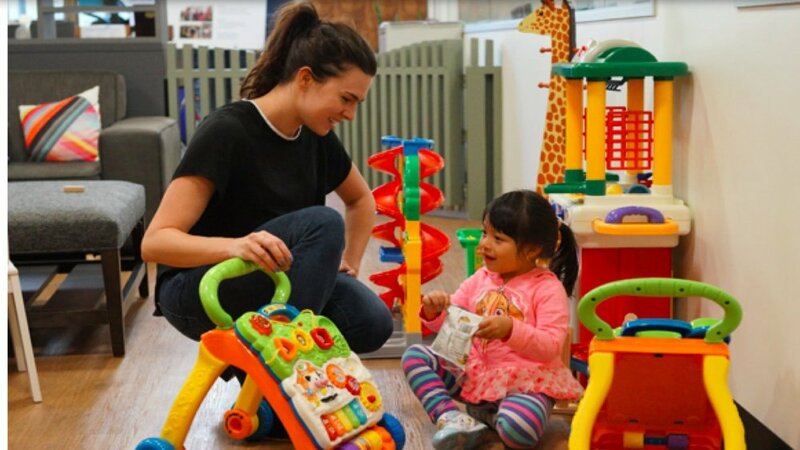 Twitter NeighborNest is a family-friendly learning center that provides access to technology for homeless and at-risk families in the Mid-Market, Tenderloin and SOMA areas. As the anchor partner, Compass Family Services has been working closely with Twitter to develop and design the programming and create a space that fosters positive connections. Last year, there were more than 1,500 hours of programming provided, more than 900 visits to the childcare area, and over 100 adults and youth engaged in coding workshops. We are excited about how the tech center has become a diverse community creating new possibilities through access to technology and a love for learning. It is a warm, welcoming space where friends of the Nest can do work, learn, socialize, and let their kids play. Programs and classes offered include: Basic and Intermediate Computer classes in English and Spanish, Family Story Hour, Housing Search, Movie Night, Music and Movement, and Bouncing Baby Class. Our computer lab is open during operating hours for families to access a computer and the internet, print, and fax. Drop-in childcare is available while parents attend classes and use the computer lab.